Music has always been an important part of my life. When I was little, I remember rocking out to favorites of my parents generation along with my own music. These days, childrens music has come so far. In addition to music that goes along with television programming, independent artists are stepping up and creating music that is genuinely appropriate for kids. I was recently asked by Waldmania! to check out What Are The Odds? Monkey Monkey Music with Meredith LaVande. This CD is being released in a matter of days, on August 31. Since we are always looking to expose our boys to different music, we agreed to receive a complimentary CD for review. Here is an introduction about what Monkey Monkey Music is from the website. Monkey Monkey Music is a children’s music program developed by Meredith LeVande, an educator and songwriter who has close to a decade of experience working with preschool aged children. Monkey Monkey Music is a continuously evolving project that’s committed to conscious and quality based music and media which puts the best interests of children first. Learning and music is a fun, joyous, experience for children, which is why Meredith’s collection of songs and live performances continuously engage both children and adults for years on end. Celebrations can be educational, and education should be fun which is why her shows, parties and programs are so successful. 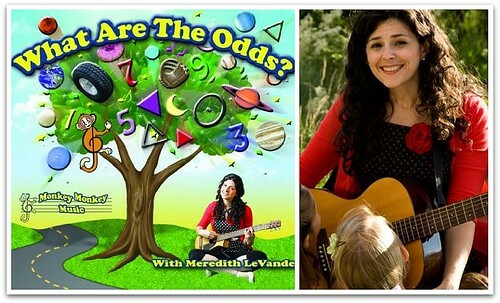 Both Meredith’s live performances, and simple listening experiences galvanize and unify groups of people, both young and old to "jump high", "shake it loud," and celebrate the topics that reference the lives and desires of young children while fostering connections between groups of people as a whole. With What Are the Odds? Meredith LeVande has created something remarkable, finding the middle road between baby songs and pop band songs where kids lyrics are simply added to music that would otherwise be played for adults. Meredith’s music is not only child-friendly, it s truly child appropriate, having been created with the healthy growth of the child in mind. We wanted to see if this song made NHL’s first grade poem come alive even more. Yes, we went right to that song and then listen to the rest! The song begins by telling you to be careful who is in your company because they may be hungry. Then, it goes into describing how parts of the food chain works. 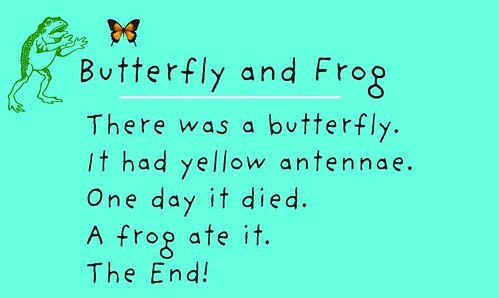 Sharks eat seals, crumbs are a party for ants, and of course frogs eat butterflies. The country twang of the song is quite different from most of the other tracks on the CD, but it works perfectly for this title. 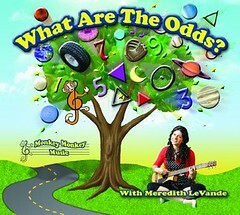 As a parent and teacher, I really liked how Meredith LaVande meshes learning into all of her songs. Not only are facts included, but favorites take on a new spin. The song "Wheels" teaches children about different modes of transportation that include wheels. The chorus includes a new tempo and take of The Wheels on the Bus song, a favorite of children and parents because it gets everyone moving. I also appreciate that the Monkey Monkey Music website includes the lyrics to all of the songs. This is often helpful when you want to make sure your child is trying to sing along. JSL really enjoyed "Hello" when we listened. It really made him listen and get involved. He was able to clap his hands, sway sideways, jump up and down, spin, shake it silly and then make monkey noises. I have been trying to put my finger on LaVande’s singing style and it is hard to do. When I listen to her voice and the background beat to a lot of the songs, it makes me think of female musicians from the 50’s and 60’s. I could just imagine her belting out tunes with a band at a Sock Hop. Do you see a problem here? Why yes, Pluto is no longer a planet. When we grew up it was one of the nine planets, but scientists have since downgraded Pluto to a dwarf planet. A technicality, but as a science teacher it bothered me a bit. I only hope that this song was written long before the recent developments. Overall, we enjoyed the What Are the Odds? CD. The song mixture was great to use with toddlers, preschooler and even my elementary aged son. The songs were gender neutral, so they are great for all children. Thanks to Waldmania!, one lucky reader will be able to win their own copy of What Are the Odds?. MAIN RULE – Answer the following question: Who will this CD be for and what age are they? 1 Bonus Entry – Leave a comment on any of my non-giveaway posts from the month of August/September. Be sure to leave a comment here to let me know which one. This Bonus entry may be done only twice per person. To enter, please follow the rules above within the comment section. The contest starts today August 29 and ends at 10:59 EST on September 12, 2010. You do not have to be a blogger to enter, but must leave a valid e-mail address for me to contact you for mailing address once the giveaway is over. I will select the winner using random.org and contact you via e-mail. You will have 48 hours to claim the prize. If there is no response, another winner will be selected. Open to U.S. residents only. Disclosure: This review and giveaway was made possible by Waldmania!. They provided me with the What Are the Odds? CD to facilitate this review. The opinions of this review are mine and I received no other compensation. This is for my one-year-old daughter. We love music. This would be for my 4yo and 20mo. My favorite children’s music as a child was anything in the electric company! This would be for my daughter Emma, who is turning 4 – what a GREAT birthday present! Turn Your Body Around is the song I am most excited to hear, it sounds energetic and fun!